Listen to our conversation about El Faro. Slade appeared on Maine Public’s call-in show Maine Calling on Thursday, along with Charles Baird, former second mate of the El Faro. For more information about Slade, and for upcoming events — including in Maine — visit rachelslade.net. Slade: “I had no idea how complicated this story was going to be. It wasn’t just about the ship. It was about what kinds of people serve on the ships that serve us. Shipping is the backbone of a global economy, and these people are out there risking their lives every day. I wanted to make a connection with our mariners, with the people who are actually doing the work to keep that global economy moving, and they’re out there, they’re there right off shore. I live in Boston, I live in Maine, I see the ships. I wanted to know who they were. Slade: “The ships that Baird was serving on were 40 years old. We don’t have 40-year-old cars anymore on the road. They’re considered antiques. These ships were built very well, but the technology on them was very old. The steel was old. All the moving parts were old. They required a tremendous amount of upkeep. You can no longer order parts for that ship. The guys were actually using scrapped pieces from scrapped ships to fix the engine, to fix parts. This was a desperate situation. When you step on newer ships, for the guys who work on them, this would be inconceivable. “El Faro was not designed as a container ship. She was not designed to carry containers, which means she had a very different profile. Her hull was slim, she had narrow hips, she was designed for speed and she was designed for trailers to roll on and go down into her massive holds, which meant she was designed to carry the weight low. Now we have these megaships that can carry 20,000 containers at one time. When containerization took over in the mid ’70s the El Faro was modified. Now she’s carrying weight differently — she’s got containers up high, she’s got trailers down below, but she still has that profile that’s quite narrow. As mariners would say she was ‘tender,’ which means that she was very responsive to changes in wind and waves, and steering changes, whereas these large container ships now are chubby and much more stable. Slade: “This is a what they call a ‘milk run.’ It was a very typical run this company has been doing this for decades. Nothing has ever happened. So the company was not tracking the ships and was not terribly involved in decision making, and that had worked for decades. Other shipping companies are much more involved with their ships — this company was not. They don’t have to be. But from my perspective, if your whole company is built around logistics, then you should be very involved with where those ships are and how decisions are being made. “Capt. Michael Davidson, at about 10 a.m. the day before the ship went down, sent an email to the shipping company saying, ‘We’ve changed our course a little bit, but I think we’re going to get in on time. And I’d like to take the Old Bahama Channel back, which means we’re going to be a little bit later, we’re going to be running a little bit slower, just wanted you to know.’ And it took literally six hours for anybody to respond to that email. Slade: “The master’s job is to balance the economic needs of the company — what people are saying in the office versus the realities of being out at sea alone, subject to the vagaries of Mother Nature. It’s two completely different ways of thinking, and a master could lose his or her job for making a wrong decision. Either putting the ship in jeopardy, or coming into port late and costing possibly $500,000, so I can’t imagine the pressures, and it takes a very strong person to be able to say no we’re taking the safe route. Slade: “Tote Maritime was fined. It’s from my perspective a nominal amount of money. They also settled with all of the families, $500,000. In admiralty laws it limited to the value of the ship, which divided among all the mariners ended up being half a million dollars each as a settlement fee, plus some undisclosed amount. So we don’t know how much each family received, but they lost somebody, so that’s irreplaceable, and Tote goes on. That’s how American business works. I’m not saying anything against Tote. Their job is to serve their clients, and I am sure that they’re being much more careful at this point. “There were three rounds of hearings, two weeks each, and a whole litany of Tote executives, officers and office staff testified under oath in front of the Marine Board. There were massive amounts of testimony, and I directly quote from them in the book so that readers can clearly understand their position and their behavior during and after the accident. “We all need to know that developing countries in Asia — China, Thailand, Korea — heavily subsidize their shipping industry. They threw a huge amount of money to port building, to shipbuilding and into transporting goods because they understand that moving goods from their countries to the United States, to Europe is how they finance their world, and it’s the same here. I find it appalling that we just forget about our ships and we forget about our mariners and we assume that everything is just going to be OK. 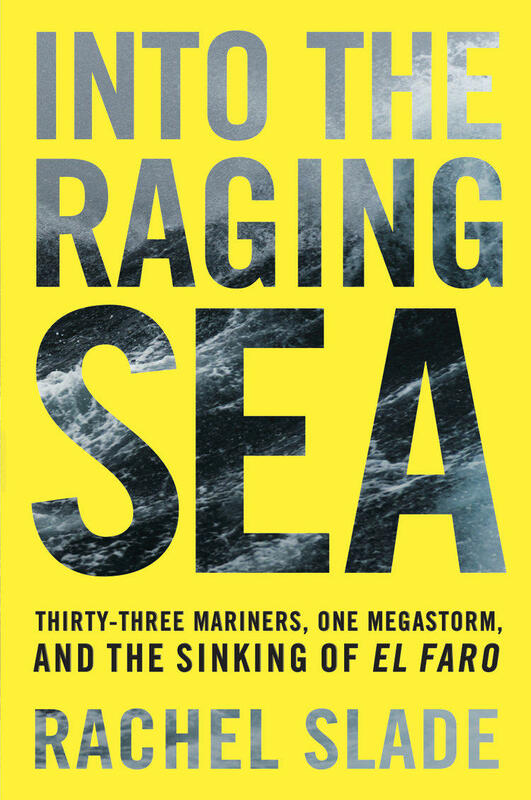 The sinking of the containership El Faro two-and-a-half years ago is the subject of a new book by Rachel Slade called "Into The Raging Sea." Slade, who appeared Thursday on Maine Public’s Maine Calling, talks with Morning Edition host Irwin Gratz about why she wrote a book on the catastrophe, which claimed the lives of several Maine residents, including the ship’s captain. GRATZ: Good morning to you. SLADE: Good morning, thank you for having me.